I returned to Africa in January 2018 to continue what I started in January 2017. Following on from an introduction to Neuro Linguistic Programming (NLP) at Unity School in January 2017. 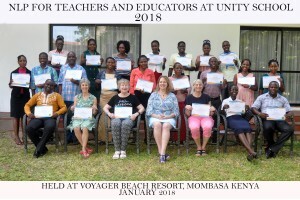 The Teachers, visiting Trustees and Management Team at Unity School all took part in the NLP Diploma for Teachers and Educators Training in January 2018. I designed and tailored this NLP training specifically for our teachers at Unity School in Kenya with the pupils as our focus. The trip to Africa and planning the training was a big project to organise from the UK. Research projects have shown Teachers trained in NLP benefit in many ways. Recognising children’s preferred learning styles and abilities and adapting to reach all the learners will help our teachers to become even more effective in their day to day classes, lesson planning and subject specialism. Everyone received a training manual and handouts. I also gave a number of NLP for Teachers books to the school to support and extend their learning and NLP application beyond the training. 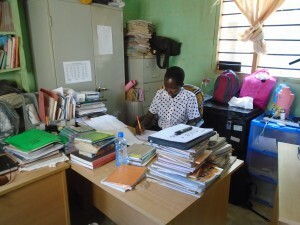 One of our teachers Madam Caroline is the NLP Co-Ordinator and in charge of the books and practical sessions. I have put in place on-going support online. Feedback from Kenyan and UK participants has been very positive and online communication has started. At the close of the training I was very proud to present all of our fantastic, hard working and dedicated team with their NLP for Teachers and Educators Diploma Certificates. 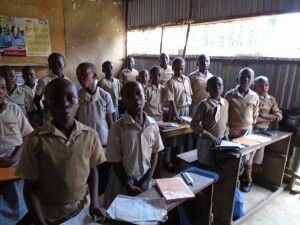 It is my aim to return to Africa and continue with this project, and involve the children in future trainings too. A link to the Friends of Mombasa Children Charity – Raising money to make safe, educate, feed and empower children from the poorest area of Mombasa. 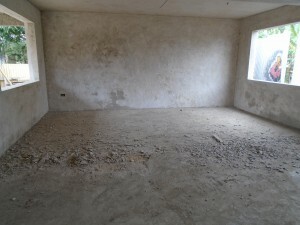 We are building a school, on the land purchased by the Charity there are currently only temporary buildings in poor condition which flood during the rainy season. 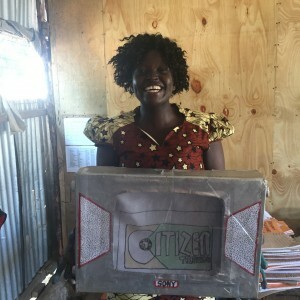 We have already started building 5 new classrooms and are busy raising funds to build 5 more, equip them and make the whole area safe and secure for children to learn, grow and play. If you can help us to raise this money by making a donation, setting up a regular payment or supporting our charity in your own way, we and the Children of Mombasa will be very grateful.